To many workers, the words “digital technologies” may evoke one simple, dismaying image: a human-like robot sitting at their desk, doing the work that they used to do! This anxiety is not different from the fear of coachmen witnessing the diffusion of cars in the 1920s. 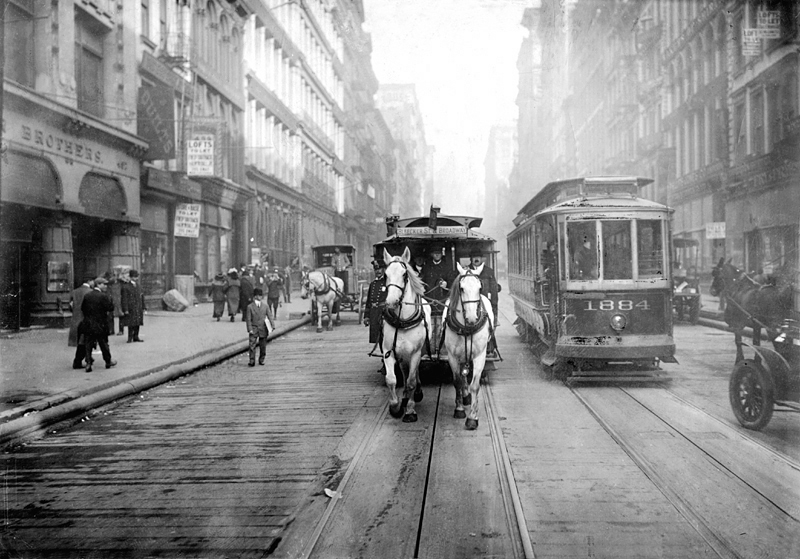 In a sense, coachmen were right: cars did replace horse coaches. However, their children and grand-children found new and often better-paid jobs in the wealth of new activities made necessary or possible by cars: automobile manufacturing, car repair, travelling sales, home delivery, mass tourism, road building, the petrol business, and so on. It was hard back in the 1920s to imagine new jobs that did not exist at the time. And it is still hard today–a fact that some sobering employment forecasts, such as Carl Benedikt Frey and Michael Osborn, tend to overlook. However, economic history shows that, after a period of disruption brought about by new technologies, economies have generally managed to generate enough jobs for their workforce. Particular sectors may use less labour but others use more and new ones open up. Will the digital economy be any different? Digital technologies should make it possible to produce more goods and services with less labour, which will expose some workers to the risk of unemployment or lower wages. However, higher productivity also translates into lower prices and new products, and higher final demand and higher employment, and possibly higher wages, thus compensating for the initial disruption. What makes this process challenging for policies and workers is its timing: the labour-saving effects of digital technologies hit employment quickly but new job opportunities emerge slowly. New markets have to be created, assets transferred across sectors, business know-how built up and new skills developed. All of this takes time. Recent OECD analysis shows that investment in information and communication technologies (ICTs) over the last 20 years had negative effects on employment in some periods, but these effects disappear over time. To speed up job creation in the digital economy, investment in data and digital infrastructure is essential. However, the share of GDP invested in ICTs has been decreasing in real terms in many OECD countries since 2001. Business adoption of advanced digital technologies could be greater as well. Many firms may well have a broadband connection and a webpage, but few use advanced ICT applications such as enterprise resource planning software, e-commerce, cloud computing or radio frequency identification. Also, the new jobs enabled by digital technologies require different skills. Some of these skills are technical, such as software development, web management, etc., but others have little to do with technology. For instance, higher frequency of digital information in firms calls for better planning and quicker responses, more co-operation across teams as well as stronger leadership. Marketing and selling over a social network require different skills than those involved in face-to-face sales. In short, digital technologies is reshaping business models and firms’ organisation, and making “soft skills”, such as information-processing, self-direction, problem-solving and communication, become more important. Many people, however, do not seem to have such skills for a digital world; as OECD estimates show, less than 40% of those using software at work every day have the skills required to use digital technologies effectively. Those who have the skills get ahead faster, which could cause higher inequality. In particular, some argue that digital technologies have raised the demand for high and low skills and reduced the demand for medium skills, though the extent to which this polarisation of jobs and wages is due to digital technologies remains a matter of debate. For instance, the OECD finds that while ICT investment led to job polarisation after 2007, the effect was only temporary. The effects of digital technologies go beyond employment and skills to the very organisation of work, by enabling firms to segment tasks in new ways and to increase the use of temporary labour. With innovative online platforms, new intermediary firms are connecting individual providers with individual customers (and often in different locations), turning some full-time, long-term jobs into an uneven flow of “on-demand” tasks. A continuation of this trend would transform the traditional employer-employee relationship, with significant implications for labour market policy and social dialogue. Digital services online can help match demand and supply across different countries and over a wider range of tasks, from low-skill tasks like data entry or administrative support to high-skill ones like programming, legal advice or business consulting. For workers, greater flexibility in the choice of working time may mean lower job security, higher income volatility, less direct, if not lower, access to social protection and more responsibility for skills development. For firms, lower labour costs and wider access to a global pool of virtual workers may erode their human capital assets. In fact, in co-operation with social partners, they should monitor emerging labour market trends and explore ways of developing labour market programmes and safety nets to help ensure inclusive growth and job quality in the digital economy. Policies have to be ready to face the challenges inherent to the digital economy and the growing public angst that accompanies them. Fostering investment in ICTs and complementary changes will help sustain innovation, productivity and employment growth. Promoting competition in markets, creating favourable conditions for entrepreneurship and supporting the development of new goods and services enabled by ICTs, while promoting skills and preparedness, will sustain growth of new markets and bolster public confidence too. Supporting workers in their transition to new jobs will facilitate adjustment and reduce the social costs. Active labour market policies, income support, lifelong learning and more responsive educational systems are more critical than ever in the digital economy. Article published with permission by OECD Observer and WEF. Autor, David and David Dorn (2013) The Growth of Low-Skill Service Jobs and the Polarization of the U.S. Labor Market, American Economic Review, 103(5), 1533-1597. Frey, Carl Benedikt and Michael A. Osborne (2013) The Future of Employment: How Susceptible are Jobs to Computerisation?, Oxford Martin School. OECD (2016a), New Markets and New Jobs, background report for the OECD Ministerial Meeting on the Digital Economy, 21-23 June 2016, Cancún, Mexico. 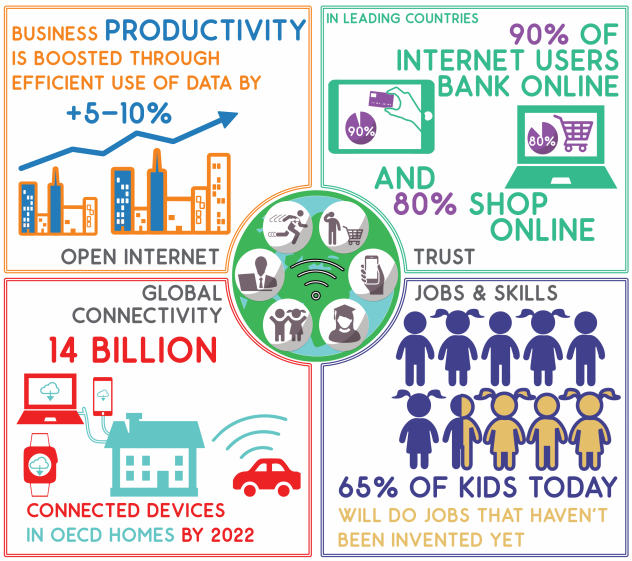 OECD (2016b) Skills for a Digital World, background report for the OECD Ministerial Meeting on the Digital Economy, 21-23 June 2016, Cancún, Mexico.